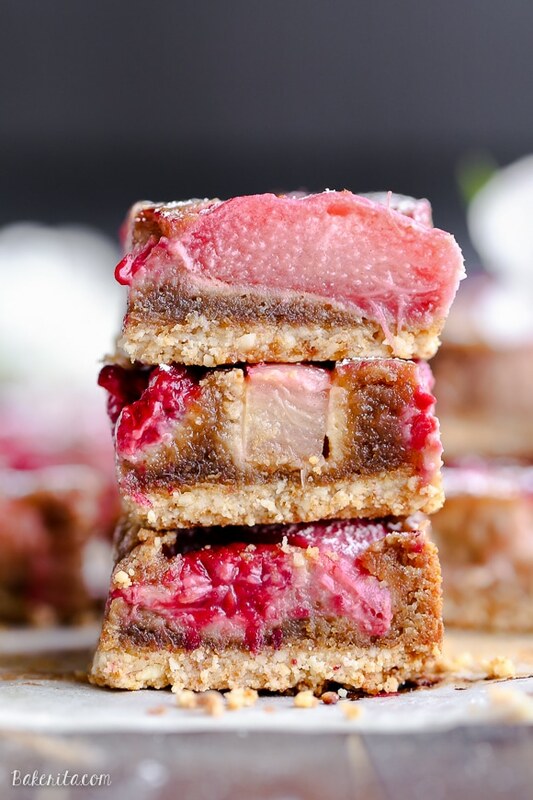 These Raspberry Rhubarb Almond Bars have a crisp almond flour crust topped with soft almond frangipane, fresh raspberries, and tart rhubarb. This recipe is Paleo, gluten free + refined sugar free. 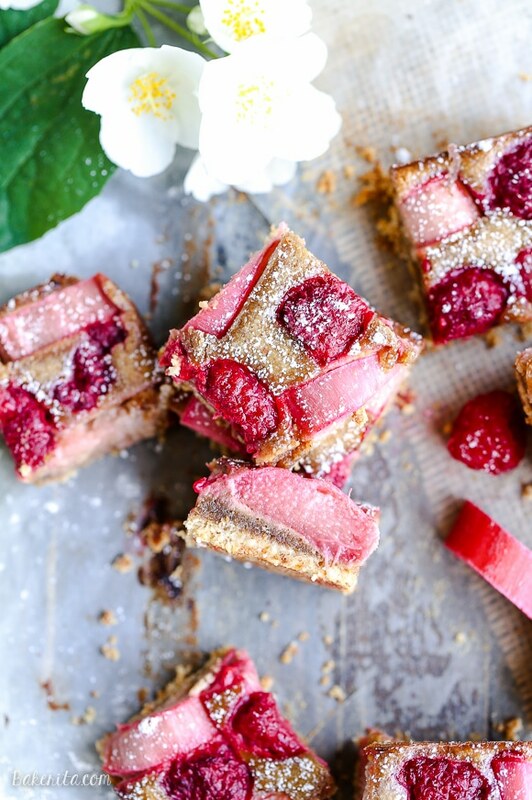 Before we talk about the swoon-worthy Raspberry Rhubarb Almond Bars staring at you, I have to make a little announcement! I haven’t officially mentioned it yet, but now that my moving van is scheduled and there’s boxes sitting in my living room, it finally feels real – and close. I’m moving back to San Diego! For those that don’t know, I was born and raised in San Diego, and I moved up to Washington when I was 17 to go to college at University of Puget Sound. After graduating almost exactly a year ago (uhhh…WHERE did that year go?!? ), I moved to Seattle, where I’ve run this blog, lived with one of my best friends, and baked my heart out for the past year with a beautiful view of the sound and a super cute patio (which I’m going to miss a bunch). I know I’m going to miss Washington a whole lot. This place is enchanting, with the evergreen trees and misty days. When you’re blessed with the occasional sunny one, where the sun reflects off the water, it creates a place so beautiful you never want to leave. I’ve been going on walks pretty much every day this Spring, trying to soak up as much of the Washington air and energy as I can before I leave. Not that San Diego lacks in physical beauty – far from it, but it’s different. California is bright and bold and energizing, whereas Washington is calmer, but invigorating and stimulating in it’s own way. Of course, I’ll also miss my friends – but I can’t let myself think about that just yet. One of the things I’ll miss most about Washington is the produce. Rhubarb is scarce is California, so I’ve been grabbing as much as I can whenever I see it at the farmer’s market, determined to get my fix. Quite a lot of that rhubarb has gone towards the testing of those bars, and even though the first and second batches had a totally burned bottom, they looked so pretty I just couldn’t give up on the testing. I was posting about the drama of my burned crust on Snapchat (add me at bakeritablog to see all future mishaps!) and after receiving words of encouragement from a bunch of you, I tested again until the crust was perfectly golden. And ding ding ding! We have a winner. The new crust is made primarily with almond flour, making these bars super duper almond-y, especially paired with the frangipane-style filling. It also has some tapioca flour to help bind the almond flour crust a bit better, coconut sugar to sweeten, salt, and melted coconut oil. It takes like 3 minutes, maybe, to stir it together and then press into the pan. The filling is a similar to a frangipane, which is a fluffy almond paste that bakes into a gooey, fluffy texture that pairs perfectly with the raspberries and rhubarb. My take, of course, is Paleo-friendly. It starts in the food processor or a high-powered blender. Almonds, a bit of tapioca flour, coconut sugar, and salt and pulverized into a powder, and then coconut oil, an egg, and vanilla are added until it’s a smooth paste. 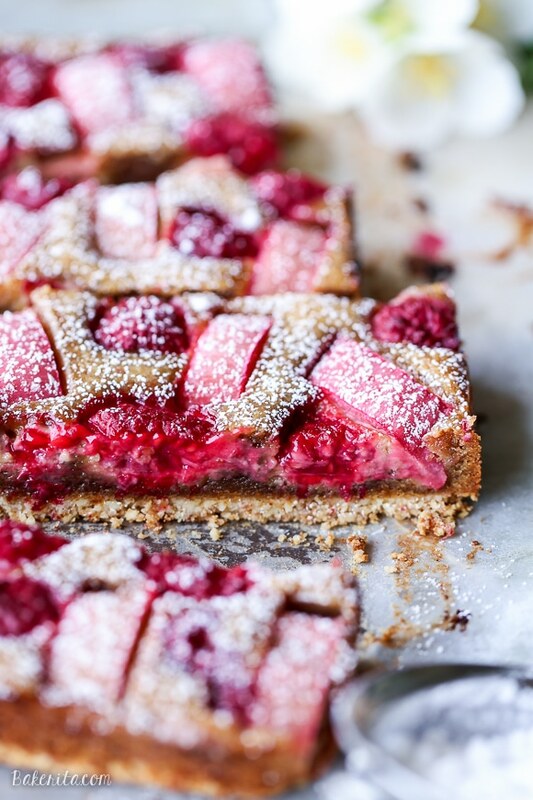 That paste is spread over the crust, which is then adorned with lemon-scented rhubarb slices and bright raspberries. In the oven, the almond filling puffs up around the fruit, which softens and melts into the filling. The crust firms up and forms a crisp bottom. The resulting bar is a bite of pure Spring perfection! The rhubarb and raspberry are both bright, tart flavors, and the sweet frangipane almond filling balances them beautifully. The crust provides the perfect amount of crunchy contrast. I also sprinkled a teensy bit of totally-not-Paleo powdered sugar on top of the bars, but that was mostly for aesthetics. It won’t affect the taste to leave it off if you want to avoid the refined sugar entirely, but it was also only about 1 tablespoon of powdered sugar for all the bars, so I wasn’t too concerned. You do you – they’re beautiful with or without the powdered sugar! In a mixing bowl, stir together the almond flour, tapioca flour, coconut sugar, salt, and melted coconut oil until fully combined, and there's no dry flour remaining. Press the crust evenly in the pan. Toss the fruit with the lemon zest and juice, and evenly spread over the almond paste. Keep any leftovers in the fridge in an airtight container. These look amazing! I absolutely love frangipane. I haven’t seen a lot of rhubarb around here but I’m going to have to try to get my hands on some so I can make these ASAP! Haha I’ll try to fit some in my suitcase! ;) Thanks Gayle! I hope your move goes smoothly, Rachel!! So neat that you’re moving back to your home state! :) And oh my goodness, these bars are making me DROOL! 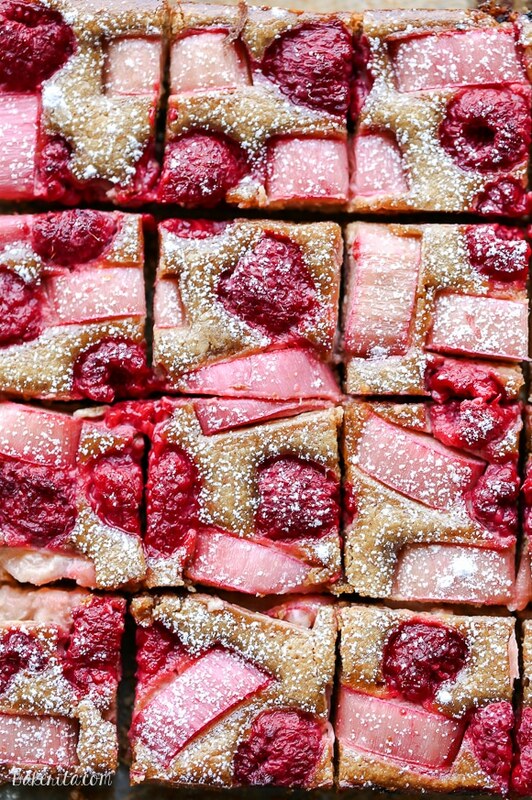 Why have I never thought to combine rhubarb and raspberries—the two were obviously made for each other. ;) Gorgeous gorgeous GORGEOUS! Thanks you so much, Lucia! Good luck with the move! I love these bars! The raspberry rhubarb combo sounds so good! Wow, love these beautiful bars. 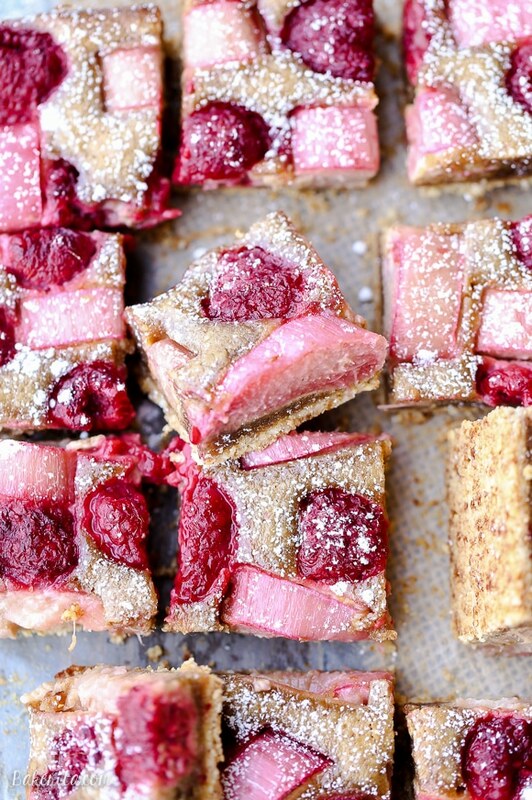 Almond and raspberry pair well together, and to throw rhubarb into the mix sounds just right!! Drooling…. These bars look delectable! Good luck with your move!! Good luck with your move! I can’t believe I’ve never tried Rhubard. These are the prettiest bars ever, and the best excuse to finally pick some up at the Farmer’s Market! These bars sound just lovely – a perfect spring treat! Haha, me too! Thanks so much, Ashley. I love rhubarb too! Congratulations on your move back home! These bars look soooo freaking good! I love that they are Paleo and it’s the perfect reason for me to use up some rhubarb! Can’t wait to give this one a go! What an amazing combination! I seriously need to try finding some rhubarb. Wow! These bars look delicious and so beautiful too. Good luck on your move! These are absolutely stunning and look so delicious, Rachel! These are gorgeous so beautifully done. They look delicious! These bars not only sound amazing but they are really beautiful in color as well. So excited that rhubarb season is here!! Take care. Made these last night and they’re already gone. Absolutely delicious! That’s what I like to hear! :) Thanks, Julia! Just made these, came out really good. I subbed strawberries for the raspberries as that is what I had. Great way to use up some of my ever growing rhubarb! Really love the layered effect. Really tasty and low guilt. :-) Thanks for the great recipe. That makes me so happy to hear, Roxanne! 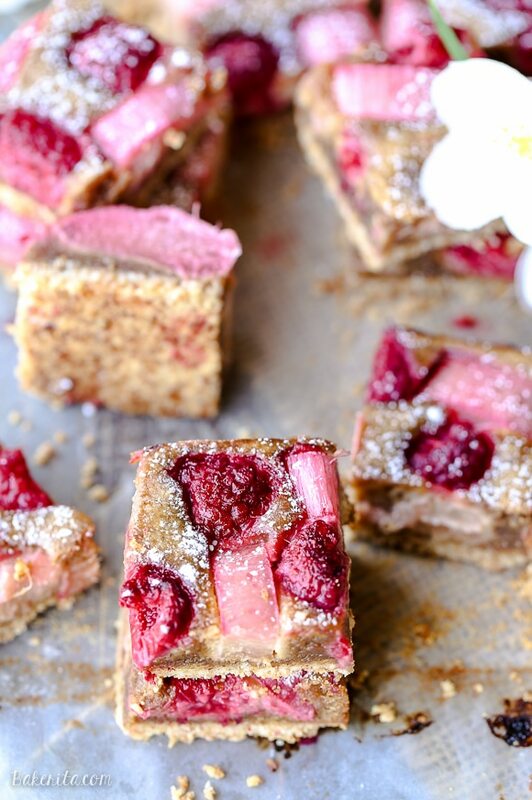 Strawberries sound delicious in these bars. I’m so jealous of your ever-growing rhubarb! Whenever I get a garden in my life, rhubarb will definitely be in it. Thanks for sharing!! I was just talking to a co-worker the other day about rhubarb. I will let them know about this recipe. I love how you paired them with raspberries. Hi Rox! You could substitute another berry in place of the rhubarb, like strawberries or blackberries, or really any other kind of fruit, so long as it’s cut into cubes similarly sized to the rhubarb for even baking. Hope this helps! These are very good! I didn’t have almonds so I used 1/2 cup almond flour for the middle layer. I thought it would crumble, but once cooled, it stayed together. Rhubarb was grown in pots on ships for their vitamin c content. And they need little care. If you can find someone with a plant, you can get a bit of the root and grow your own. So glad you enjoyed them, Anita! That’s such an interesting fact about rhubarb – once I have my own place, I’m definitely going to try to get my hands on a plant. OMG Rachel – this recipe is DIVINE. 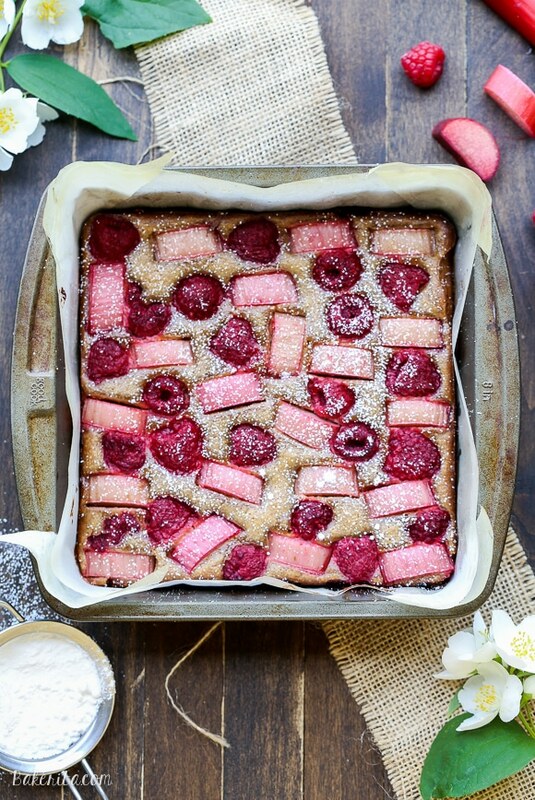 I just came across your website today and thought these sounded yum, and just happened to have a big bunch of rhubarb in the fridge (only had frozen raspberries from a friend’s garden). Tasted a teensy bit of the ‘frangapane’ filling and was hooked and couldn’t wait while it was cooling from the oven…. (but made myself anyway) then we 4 of us here had a taste and …. oh dear …. I for one are in love!!! This will definitely become a staple in our household!!! Thank-you so much for creating and sharing this deliciousness and now can’t wait to try more of your yummies! This looks so good that I decided to make right away, thinking: perfect for breakfast tomorrow morning. It looks nothing like the picture above, the paste was very very dark. It’s in the oven as I write this, I cross my fingers it will turn out good despite the difference of appearance. I am wondering if the almonds in the filling should have the skins removed. What do you suggest. Hi Rosalie, I’ve always used regular almonds with the skin on. Thank you for your recipe! Can I freeze the leftovers? Do I need to reheat it or just defrost and enjoy? Hi Quyen, yes you can freeze and you can just let them defrost :) enjoy!